campbell soup co. has been trying hard this year to turn itself around, with new soup flavors, higher prices, health-conscious acquisitions and more. but now the camden, n.j. company, stuck with sliding profits and sinking interest in soup, is taking a more difficult route: shutting down two factories due to "excess capacity." the sacramento plant, which makes soups, sauces and beverages, will close in phases before shuttering for good in july, the company said. as campbell’s oldest american facility -- it was built in 1947 -- the factory has the highest production costs in the company’s network. about 700 full-time employees will lose their jobs, according to campbell. production will be redistributed to plants in maxton, n.c.; napoleon, ohio; and paris, texas. campbell is also closing the doors at its south plainfield, n.j., spice plant. the factory will go dark by march, and 27 employees will be affected. spice work will be consolidated at a larger facility in milwaukee. 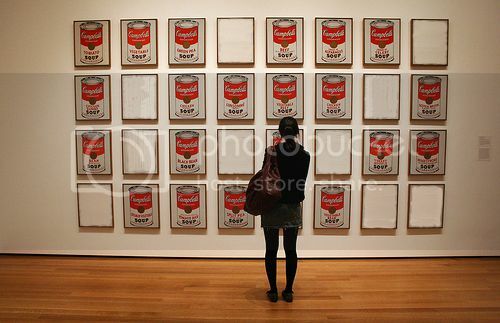 mmm, mmm, good, mmm, mmm, good, campbells soup is mmm, mmm, unemmmployed. b of a to lay off 16,000 workers. wanna bet no e of them are the execs who made bad mortgages? is there a backlash against comedienne mindy kaling? we don't know where we've been lately, but the moderate voice has a great, sophisticated new look. good going, joe! are libertarians stupid, or just really stupid? is a ph.d. worth it? and why they won't open. airplane windows, mind you. 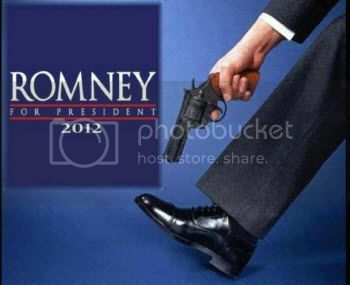 according to willard mittens romney. 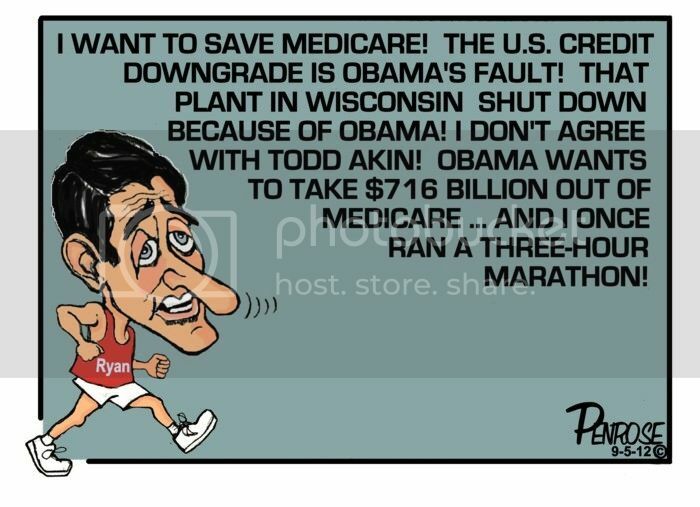 but, he was against high cost emergency rooms as healthcare before he was for them. it doesn't work, especially if the wrong people are being forced to abide by it. it's not the average working person that is the problem....it's the banksters, the 1%, goldman sachs. where is their austerity? a sneak peek at those stories you probably haven't heard about on the talking head shows. flat wrong...and not sorry at all. that wouldn't be the last demand from the campaign: romney himself almost pulled the plug on the whole thing minutes before the broadcast, [univision anchor maria elena] salinas said. while introducing romney at the top of the broadcast, salinas's co-anchor, jorge ramos, noted that the republican candidate had agreed to give the network 35 minutes, and that obama had agreed to a full hour the next night. ramos then invited the audience to welcome romney to the stage — but the candidate didn't materialize. "it was a very awkward moment, believe me," salinas said. "our president of news was talking to the romney campaign and negotiating it," salinas said. "but at that point, you can't really argue with that. the candidate is there, everyone is in their seats, the show must go on. there's a limit to how much we can object to it." the compromise reached was that the anchors would note the discrepancy in the candidates' time commitments at the end of the broadcast. but salinas said, by then, the crowd was cheering so loudly that they drowned out the anchors' words. this is the guy who wants to be president? I asked this on Twitter and never saw an answer. If Mitt Romney believes his approach “will put 23 million people back to work again,” why does he plan to create only 12 million jobs? If the Boy Scouts made a moral decision earlier this year, what do you call the ones from the early 1970s? In similar TANJ-is-a-feature-not-a-bug fashion, those who wonder why no one trusts the NYC police department when a car is involved are referred to this Forbes piece. What would you expect when your force is made up of a bunch of car-dependent, overprivileged parking Lon Gislanders and Joiseyites? I am now the proud owner of not one but two IBM ThinkPad T40s. All things considered, the only problem with these top-of-the-line-at-le-fin-de-siècle, half-gig of RAM, 40-and-that’s-really-rounding-up GB HD machines is that their wireless capability is 802.11b. How difficult is that going to be to upgrade? *The three reasons to keep the WaPo alive are Strauss, Sarah Kliff (who blogs chez Ezra), and Michael Dirda, who I probably irritated the last time we were together by waving buyable copies of The Best of John Sladek in his face. actually, to los angeles international airport. 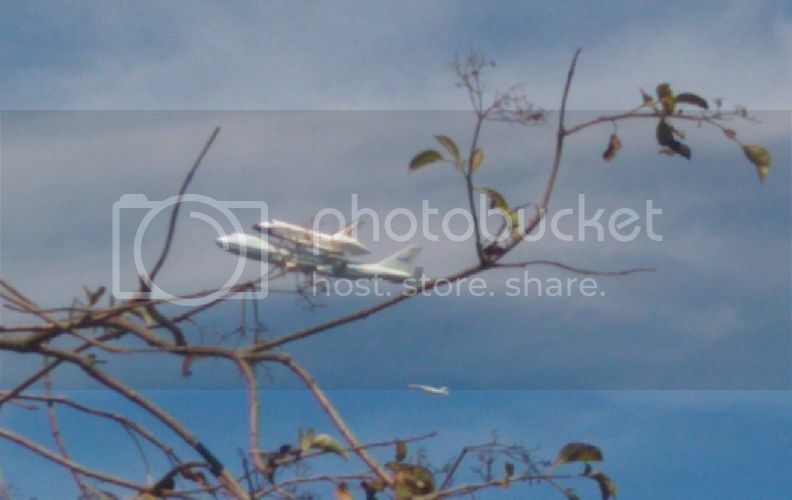 the space shuttle endeavor made its final flight today, taking off from edwards air force base in the mojave desert, flying up to sacremento, then over to the bay area, then down the coast for one final loop around southern california. 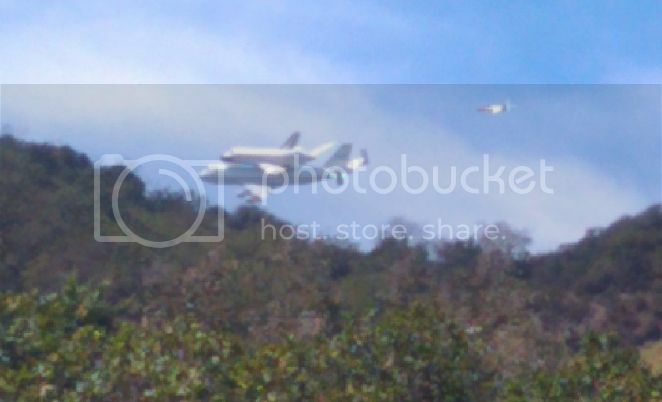 skippy got to see it pass by mulholland drive. is romney tanking gop's hopes for a senate take-over? it’s hardly the kind of definitive evidence we need to conclude mitt romney’s in the process of burying his presidential prospects, but there’s just no way for anyone to spin the new national pew research poll as anything other than really bad news for the gop nominee. taken from september 12-16 (in other words, before the boca moment video hit the airwaves), it shows barack obama opening up an 8-point lead among likely voters, while also topping 50%. if you want a real topline shocker: the same poll at this point in 2008 showed obama and mccain even at 46%. if there’s been a poll this year showing obama outperforming his 2008 numbers at any point whatsoever, i certainly don’t recall seeing it. at this stage in the campaign, barack obama is in a strong position compared with past victorious presidential candidates. with an eight-point lead over mitt romney among likely voters, obama holds a bigger september lead than the last three candidates who went on to win in november, including obama four years ago. in elections since 1988, only bill clinton, in 1992 and 1996, entered the fall with a larger advantage. but don't start popping the champagne corks just yet. as ed points out, this poll could be an outlier. as opposed to mitt romney himself, who is an out-and-out liar. why not adopt a skull? ye pastafarians out there today! apparently parts of this video have been floating around youtube for a few weeks, but david is the one that brought it into mainstream media. things just aren't going well for romney. on top of the mean girl politico piece, which gossips that his campaign is in tatters (she-dooby), romney is not going to win over any undecided voters who hear what he really thinks of them. 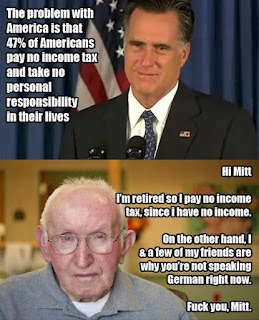 then, according to romney, you are a moocher. and, on a personal note, may we just say how good it feels to have the gop field a candidate whose campaigning skills make mike dukakis look like ronald reagan. If the new SAGgingAFTRA gets up in arms about this, maybe they will be worth paying dues. But that I heard about this from Patrick first isn't encouraging. As a Rutgers-Newark alumnus—not to mention the father of two Jewish daughters—I find this sad, pathetic, and personally revoting. The most diverse campus in the United States, whose law school produced the next Senator from Massachusetts,* has some bad apples in it, too, apparently. I'm not reading blogs much. Lawrence Norfolk has a new novel out. There is a direct relationship between those two statements. Highly recommended. But you would expect that, no? *The other candidate, who attended only private college and law school, pretends he's the one who is "of the people." And I gave at the office. are all the racists on the right? and then there was a man named stuart perlmeter. i first ran into him in the 7th grade when he taught some classes at my middle school. this was around 1987. he was a weird guy, or so it seemed. he had big curly hair. his classroom was festooned with lyrics by some band none of us had ever heard of before called talking heads. and he was very into science. i have no idea why this man ended up in the springfield public school system. because he was kind of a famous guy in the science world. mr. perlmeter used to tell us stories. he actually worked with dian fossey on gorillas. don’t believe me? he took the last of these pictures in this 1981 national geographic article. once i started high school, he started teaching there. but he didn’t bother with the ap classes. he focused on the kids who weren’t much engaged in school, those at risk of dropping out. he started a program where they could go observe bats. he wrote about his experiences in popular and academic journals. this came out the year after i graduated. i remember some of the kids in these pictures. for all this work, mr. perlmeter won oregon’s school teacher of the year award in 1990.
certainly not every school had a guy like this. but we also had all of these teachers who taught kids who were underprepared, dealing with unemployment, substance abuse and domestic violence at home; who had no family expectations that they would amount to anything. and these teachers, underpaid no doubt, persevered and tried to teach these kids. sure, 20% of them may have been terrible. are 20% of administrators not terrible? 20% of political pundits? mediocrity is part of the world. but the majority of teachers ranged from good-hearted people to superheroes. 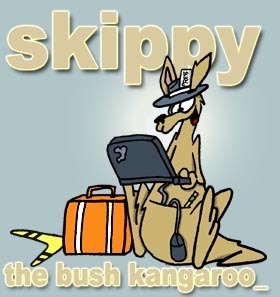 for skippy, there were thankfully too many wonderful teachers to remember here. there was miss bennett, the wry, sarcastic high school science teacher who imparted her love of the mysteries of the physical world to us kids. there was mr. hammond, gruff exterior, with a heart of gold and a brilliant mind that could make adolescent brains excited about geometry. there was mr. barnes, the clarinet-playing band teacher who grew up on chicago's southside, and who taught us kids the wonders of jazz in band practice. there was crazy sonja pohlman, the erudite redhead who got stuck with the privelege of teaching advanced literature to the misfits in high school, and showed us that learning was more than memorizing; it was imagination, it was critical thinking, it was acting out scenes from dostoyevski and trips to the mall to simply watch real people interact. the chicago teachers union deserves everything they are asking for because many of them are heroes. for some, for kids like me, they are role models who give young people social mobility and who teach them that learning is a great thing. they know that standardized testing is worthless, that it bores everyone (as its early iterations bored me in high school), that they need to be allowed to teach and inspire. they deserve what they are asking for because they care more about young people’s future than anyone else in society, often more than the students’ own parents and certainly more than the education capitalists and liberal pundits who concern troll about these kids without having interacted with them. these teachers deserve what they are asking for because each and every day, many of them face confused, angry kids who have seen terrible things at home and can’t deal, who bring hateful words and knives and even guns into to the schools, because they face cursing and violence and horrible things on a daily basis, things rahm emanuel can’t even dream of. the chicago teachers union deserves the world because they take kids like me out of working-class families and help them fulfill their dreams. those who attack them place themselves on the other side of the class divide, on the side that promotes social inequality and the side that provides no incentives for good teachers to stay in working-class schools since poor test scores, largely a result of poverty, will cost them their job. they claim to help children but don’t understand poor public schools; they claim to support policies that will improve education but promote ideas that will enrich capitalists at the expense of students. indeed. you are either on the side of teachers or on the side of those who will crush their union. in the middle of the strike, there is no gray area. which side are you on? i side with the people who changed my life. there is no winning a game when the rules have been rigged, but there is power in numbers. there is power in struggle. and there is power in pizza. the easiest way to support chicago teachers is to order them a piping hot pizza pie. you can get food to the picket lines by calling gus or daisy at primo’s pizza at (312) 243-1052. when pizza shows up to the tired picketers, everyone’s spirits are lifted. it’s read to them from which part of the country a pie was ordered and it makes them feel that much less alone. it may seem like a small, kind of silly thing, but trust me, it means a lot. big apple pizza's yelp page has been deluged with five-star reviews, completely overwhelming the rightwing bad reviews, and driving the overall rating to a solid five stars. so many people have contacted big apple to order pizza in solidarity that van duzer has begun asking them to contribute to his favorite charity, the van duzer foundation, which "[assists] families and individuals in st. lucie county florida, who are experiencing financial and personal hardship brought about by unforeseen crisis or tragedy. when discussing the death of americans. hunter over at the great orange one's puts it succinctly. with his foot in his mouth, can he taste the bullet hole? and the right wing melt down over a bear hug. bearhug-gate. really. wtf. are there democratic headquarters in the area? i think dems should call up and order some slices from big apple pizza for the volunteers. and the reminder of the ineptitude of a certain administration. 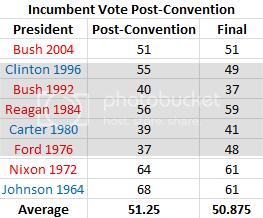 in contests involving an incumbent president, the candidate with a higher share of the vote following his convention in gallup polling has won every election since 1964. we can go further: no modern candidate has won the presidency without taking a lead after his own convention. and there is a strong relationship between the incumbent’s share of the vote and their eventual finish in november. * to take a recent example, bush peaked at 50.4 percent in the realclearpolitics average after the rnc, and eventually won 50.7 percent of the vote. and it’s worth noting the largest errors involved races with incumbents who took the presidency due to assassination or impeachment (ford, johnson), and a year in which the polls systematically advantaged the incumbent (1996). as nate silver (two nates, no waiting) extolls, it's too early to make that much out of this bounce. but nate (the first nate, the new republic nate) makes a compelling case. if we were mitt, we'd be worried. and a big happy birthday to our own cookie jill! chris kluwe. love this guy. do some chimpanzees have a secret handshake? what is riskier than living poor in america?